What's important to me may not be important to you. But we can both be loving and kind about our differences. Sometimes I find myself focusing on things that seem important at the time, but they really don't matter. 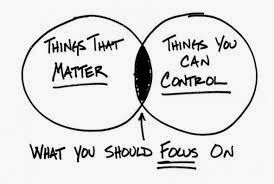 And all too often, I find myself focusing (and ranting and raving) about things over which I have no control. What I should be focusing on is a very small subset of this. Life would be so much easier.